The Digital Maintenance Manager (DM) from SICK’s Smart Service Suite is a service platform for managing, visualizing, implementing, and recording the maintenance requirements of SICK analysis and process measurement sensors and systems in process plants. The DM displays all the installed sensors and measurement systems in digital form and provides plant operators with up-to-date information about their current and future operating status. On this basis, the DM automatically identifies the operational and statutory maintenance requirements and coordinates the upcoming service dates. The integrated document management system manages all the service activities carried out by internal or external staff and keeps the test documents up-todate, which means that a full documentation set is available quickly in the event of an audit. The Digital Maintenance Manager is a non-proprietary web front-end that can be used via a web interface from any device with an Internet connection. The service platform is compatible with all analysis and process measurement sensors and systems from SICK and offers plant operators the opportunity to manage and visualize the entire SICK field instrumentation and to integrate it into an end-to-end maintenance and document management system. With the help of a traffic signal system, operators can immediately identify the maintenance status of sensors and measurement systems in machines and plants. This allows maintenance to be planned in advance and implemented either by in-house engineers or by SICK LifeTime Services. The SICK DM allows operators of waste incineration plants, power stations, steel and cement works, and plants and refineries in the chemical and petrochemical industries to simplify their maintenance planning process. The platform arranges and reports on the maintenance activities agreed with SICK, with other providers, or with the in-house service team. Once the work has been completed, the accompanying service documentation is automatically created and updated. The integrated document management system enables operators to access all the relevant service reports for gas analyzers, dust measuring devices, or emission monitoring systems, for example, at any time and with just a few clicks of the mouse. The entire test documentation is also easily available in the event of an audit. 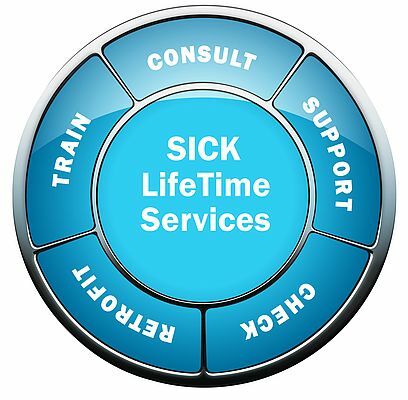 The service platform of the DM also gives operators access to other Life Time Services from SICK, if required. These include a direct remote connection via the Internet to the SICK sensors and measurement systems. The Condition Monitoring and Predictive Maintenance solution allows status figures and statistics from the SICK field instrumentation to be analyzed and evaluated directly in order to identify and prevent faults, failures, and the risk of damage at an early stage. Other service modules, for example for support in relation to QAL2 and QAL3, are also available. Customers can also add function tests and annual operational checks (AST) to the DM. By fully digitizing all SICK’s analysis and process measurement systems in one plant, the DM allows for comprehensive installed base management. It also paves the way for process automation 4.0 and therefore for the value-added networking of sensors and measurement systems in machines and equipment and the systematic evaluation of machine and process data in order to minimize downtimes and improve the productivity of process plants.